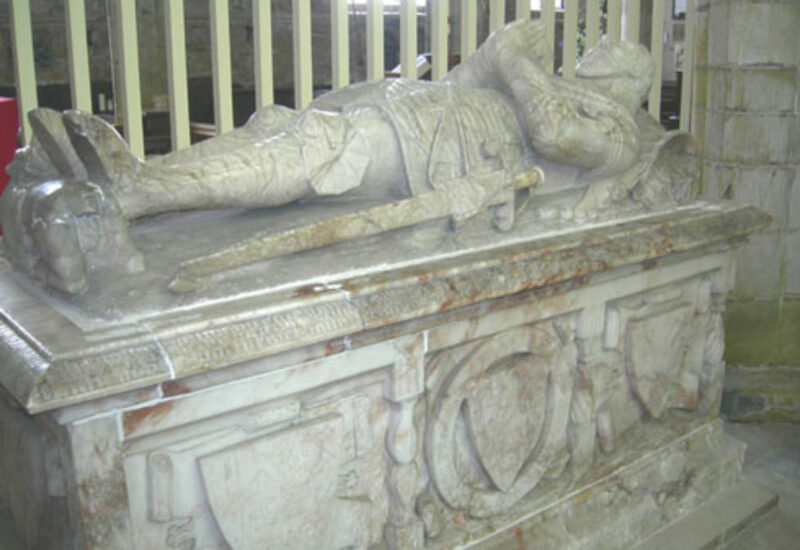 In the north aisle of St Marys and St Hardulph’s, Breedon on the Hill, Leicestershire are found three Shirley family monuments (fig 1). It would be hard to ignore the difference in styles of these three monuments placed so closely together. 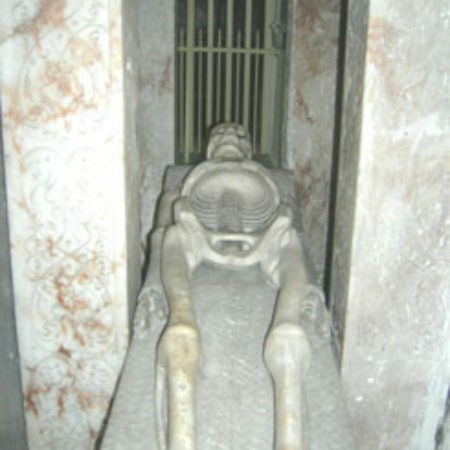 However, rather than get distracted by debates on which is the superior tomb and by which standards this conclusion is drawn, it may be more useful to consider the monuments together as a whole and their location when trying to understand their function. 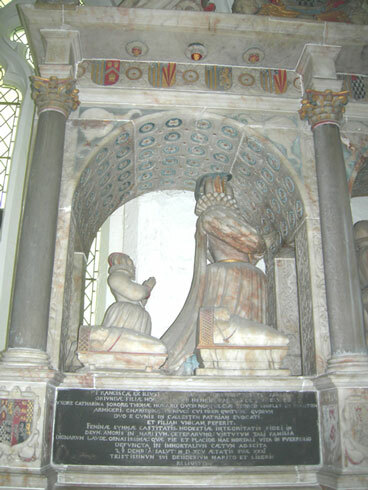 George Shirley 1st Bt (1559 – 1622) commissioned all three monuments within a space of 13 years. Therefore, their difference in style cannot be accounted for by a change in commissioner. Neither can it be explained by a change in the availability of craftsmen. 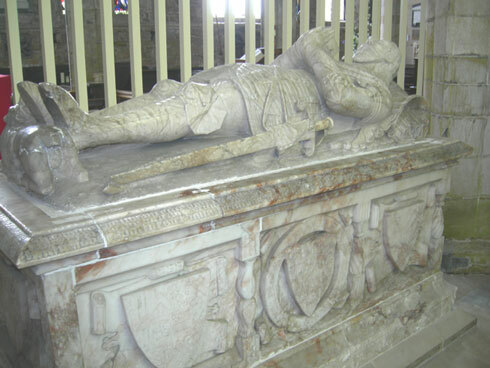 The Royleys, a local family of alabaster craftsmen, produced the traditional forms of funerary monuments from around 1546 – 1614; whilst recent émigrés from The Netherlands, the Hollemans. ran a workshop introducing the new Italianate style from 1568 -1628. Thus both workshops were in production when George Shirley was commissioning his monuments.-6 This suggests that it is not a change in availability that decided stylistic choices. Since they are consciously placed together by one commissioner it can be assumed that there is a narrative. After all the creation of a monument is a symbolic act. Sir George Shirley was actively preserving his family’s lineage and claims to social status. However, Sir George had no need to manufacture his heritage. 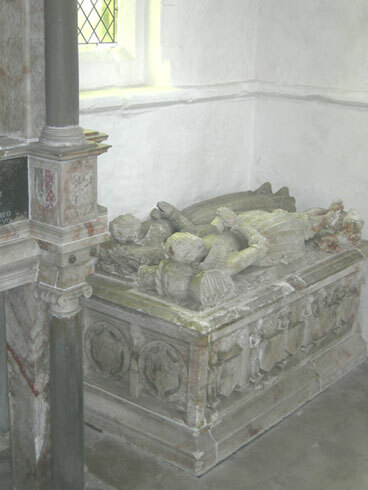 His grandfather, Francis Shirley, had bought the priory and its lands during the dissolution of the monasteries in 1536, with the express purpose of using the church as a resting place for the family.At the same time, the priory church, St Mary and St Hardulp’s, replaced the adjoining parish church, which was in a ‘ruinous state’, and the priory buildings were used as a school, all funded by the Shirleys.-7 The family had had connections with the priory since the twelve century and buying the lands consolidated an already large land ownership. The Shirley’s were able to claim a family lineage back to the Norman Conquest, when a Norman knight married a local Saxon Lady. 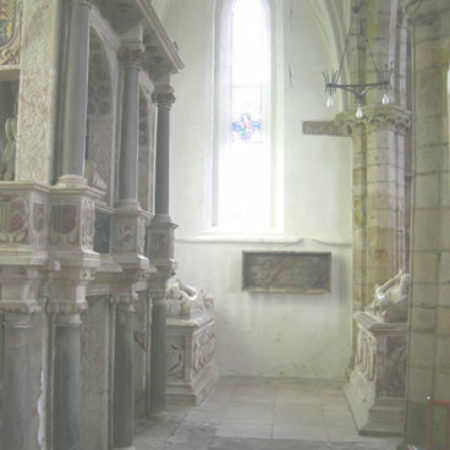 The placing of the monuments together in this church creates a sense of continuity. The church is full of Norman and Saxon carved detail. 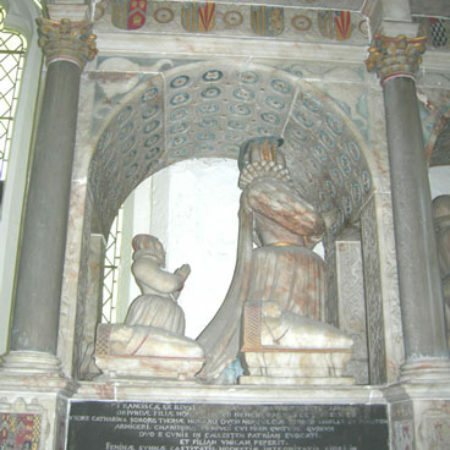 The monuments commissioned for his grandparents and father are in a traditional style, they look back to pre-Reformation times, whilst the memorial built for him and his first wife is of a contemporary style celebrating the continuation of the line. The family are present as kneeling figures. The Latin inscription on Frances’ memorial provides a clue to why this confirmation of status was so important to George Shirley. 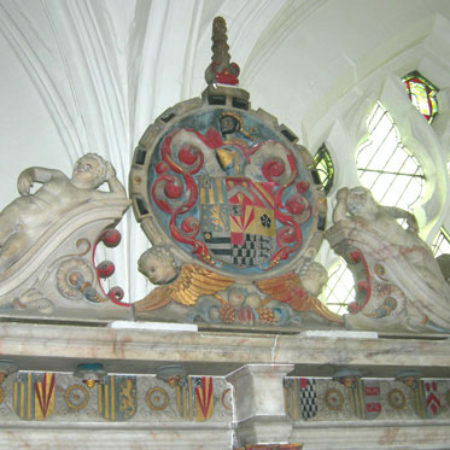 George makes sure that his connection with Thomas Howard 4th Duke of Norfolk, the uncle of his wife, is made clear and by this claim he both attaches himself to a powerful family but also affirms his own recusancy. Regardless of the Reformation, a Catholic Squire has placed himself in a newly converted protestant church. 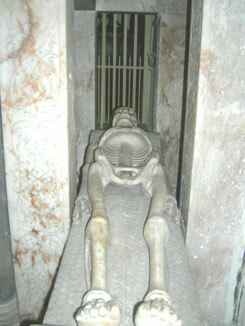 It is George Shirley’s recusancy that is essential to the understanding of the significance of these monuments. 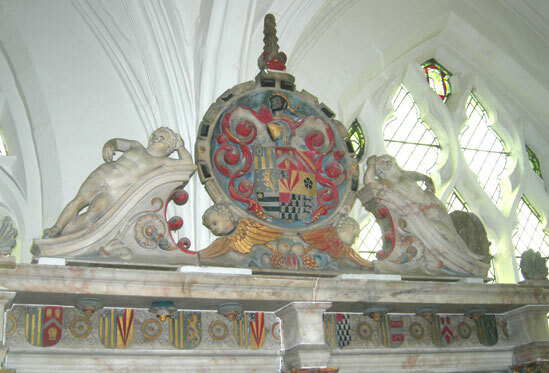 Shirley was preoccupied with maintaining his place amongst the honour community of the gentry.-8 He not only commissioned these monuments but the huge illuminated family tree, the Stemmata Shirleiana, and was the first to buy a baronetcy from King James in 1611. As Cust, argues the Catholic gentry of this time faced a dilemma: rejecting a state imposed religion whilst staying loyal to the King and maintaining power in the area whilst suffering slights, such as being disarmed. The irony cannot have been lost on the congregation. 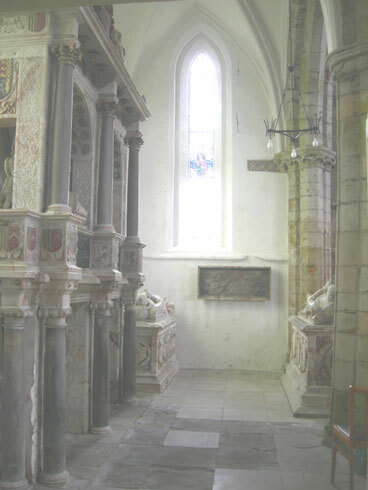 In a small church, recently stripped of rood screen and other images, there in the north aisle are the ever present brightly painted effigies of the Squire and his family in attitudes of prayer. This in a church they rarely attended. · Bayliss, J.C., (1993). 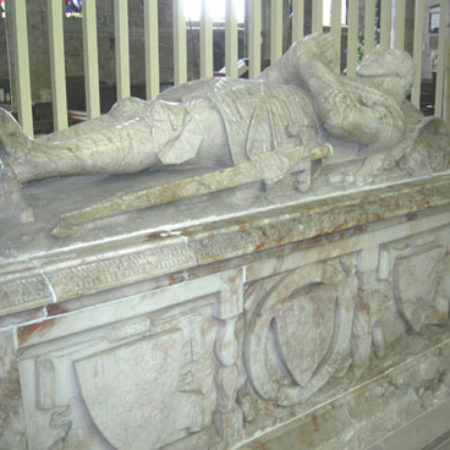 ‘A Dutch Carver: Garrett Hollemans I in England’, Church Monuments Vol.8 pp.45-56. · Cust, R., (1988). ‘Catholicism, Antiquarianism and Gentry Honour: The Writings of Sir Thomas Shirley,’ Midland History Vol. 23 pp.40 – 70. · Shirley, Sir S.E. Bart, (1873) ‘Stemmata Shirleiana: or the Annals of the Shirley Family, Lords of Nether Etindon in the County of Warwick and of Shirley in the County of Derby,’ [online] London, Nichols & Son. Available at http://archive.org/details/cu31924029787250 (accessed 06.08.13). · Williams, B.C.J., (1996). 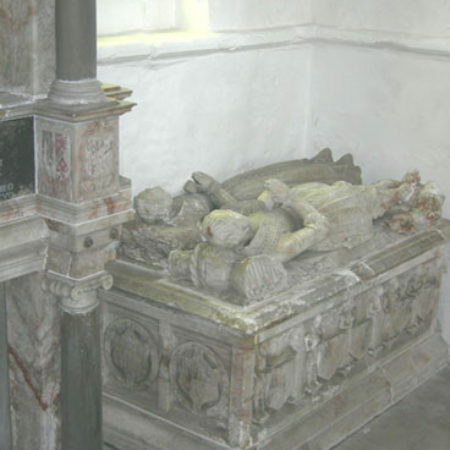 The Story of St Hardulph Church, Breedon on the Hill. Nottingham. Hawthorne Printers Ltd.
Special thanks go to the volunteers who ensure that St Mary and St Hardulph’s is open to the public.In twenty years of visiting this little gem of a church it has never been locked.